Joinery Timber is the non-structural use of wood for items such as windows and doors, cladding boards, skirting boards, door linings, staircases and architrave. It also includes decking components such as decking boards, handrails and banisters as well as solar shading. Brookridge Timber Ltd has long established links with various mills in Scandinavia, and Russia who provide a range of joinery timber in various qualities to satisfy the quality of timber required in all of the above applications. We keep large stocks of product on the ground available for immediate delivery. 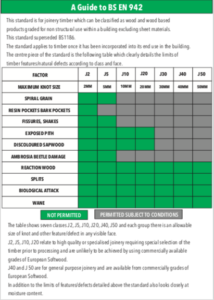 The standard governing the quality of joinery timber used in a particular application is BS EN 942 which simply states that timber in joinery shall be suitable for its intended purpose. 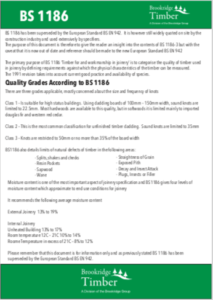 This standard supersedes BS1186 Part 2 and details of this standard can be found on the download below. Brookridge Timber stocks the highest grade of unsorted Scandinavian Redwood available for immediate delivery in any quantity. The wide specification in sizes has been selected to cater for all requirements and below are details of the sizes held in stock. Customers can order just one size or a combination of various sizes making any joinery project possible.